Today is the second anniversary of Maeve Binchy’s death, and we miss her greatly. 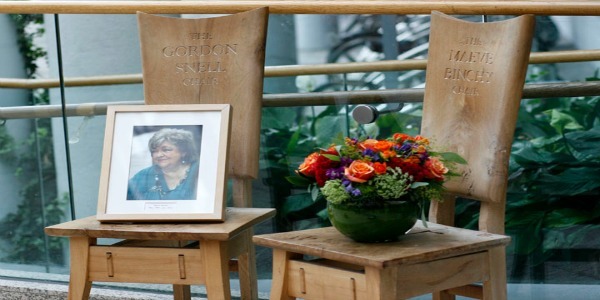 Every day as we pass through the college Atrium, the Maeve Binchy chair reminds us of the warm and generous woman that many of us at NCI were lucky to have met, and to have worked with throughout the years. “Maeve’s literary genius is matched by her humility and her personal generosity and openness. It would be remiss of me at this gathering not to refer to her generosity and kindness to the students of the National College of Ireland where she initiated and led a writing club to motivate and encourage aspiring writers. This club led to the publication of the book The Maeve Binchy Writer’s Club, which was launched in NCI and contains her 20 weekly letters to her students, as well as contributions from ten of the guest speakers on the programme. She remains an inspiration to us all.